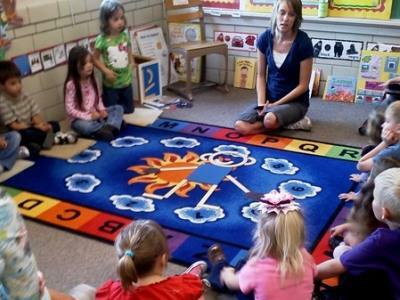 Creek Valley Preschool is an exciting program created to help children grow socially and academically. Our program is available to area children through partnership with Volunteers of America - Western Nebraska and Creek Valley Public Schools, along with financial support from local trusts. Our preschool is located in the Creek Valley Elementary school in Chappell, Nebraska. We offer a hands-on curriculum that emphasizes pre-literacy skills, early math and science awareness, creativity and positive social and emotional growth. Our mission is to provide children with a fun, safe learning environment where they can experience a positive start to their academic future. Monday - Thursday, 8 a.m. - 11:30 a.m.
Breakfast & Snack are also provided! Transportation options for Lodgepole students. Partnership with local childcare center for after school services.